TCN | Will Harvey, other storms move Texans’ attitudes about climate change? Will Harvey, other storms move Texans’ attitudes about climate change? 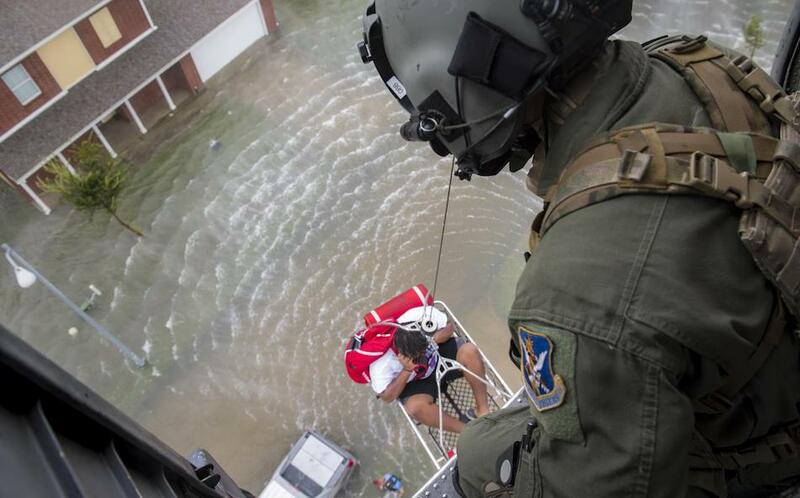 A special missions aviator with the 41st Rescue Squadron of the U.S. Air Force watches as a Houston-area evacuee is lifted from a neighborhood where homes were flooded during Hurricane Harvey. “Will Ike, other storms spur new thinking?” That headline introduced the very first article published in Texas Climate News in 2008, several weeks after Hurricane Ike brought widespread devastation to the upper Texas coast. Nine years later, after far greater devastation by Hurricane Harvey, we decided to pose a variation of the same question to a different group of thoughtful Texans whose work and experience give them diverse vantage points to reflect on it. They include an environmental historian, a climate scientist, a disaster-response expert, an opinion-survey director and others. The emailed answers, which appear below, were decidedly mixed, ranging from hope that Harvey may reduce Texan doubts about climate change to skepticism that the storm will have much impact on dug-in Lone Star attitudes to a belief that Texas can address climate-change dangers without accepting climate science. Since then, some major Texas city governments have indeed adopted certain policies and practices explicitly reacting to the hazards of human-caused climate disruption. But no one would dispute that at the state level Texas has lagged far behind other major states like California and New York in taking climate change seriously. And if Ike played any role in inspiring “new ways of thinking and behaving” about climate change in Texas, it still hasn’t prompted any concrete action on the most prominent public issue that arose in direct response to that storm. That issue involves whether to build an “Ike Dike” system, or some other sort of storm-protection array, to guard Galveston and other parts of the Houston region, including crucial industrial infrastructure near Galveston Bay, against future storm surges. Nine years after Ike, despite much debate and discussion, no such project has yet been authorized, much less funded and built. There was another reason that late 2008 was a good time for TCN to ask about Ike’s possible impact on attitudes in strongly Republican Texas. There were signs that theretofore skeptical Republicans might be accepting the projections of climate science. After all, Republican presidential candidate John McCain had just been warning about the looming hazards posed by manmade climate change as he proposed a plan to reduce heat-trapping pollution similar to Democrat Barack Obama’s. After that, of course, polls showed that most Republicans – including prominent office-holders in Texas – rejected McCain’s acceptance of climate science. Instead, they have variously denied, dismissed and belittled conclusions by the world’s scientific community that identify the dangers of climate disruption. Opinion surveys more recently have found less climate-change skepticism among Republicans in general. But the party’s post-2008 turn from climate science still holds sway in critical ways. President Trump himself has called manmade climate change a hoax. And the Trump administration has based various actions to reverse Obama administration initiatives to reduce heat-trapping pollution on an explicit rejection of core findings by climate researchers. Will Harvey persuade Texans to incorporate the risks of manmade climate change more widely into government, corporate and personal decision making – especially regarding adaptation, preparedness and resilience? Will denial or dismissal of climate-change risks decline significantly in Texas because of the storm? The climate change issue was interjected into the Harvey event almost as quickly as the rains fell. It is difficult to say how and if it will be introduced into the recovery and future preventive measures on a state and/or national level. Harris County Judge Ed Emmett’s statements about rethinking our local flood-control agenda, however, indicate how climate change can become part of the dialogue without political leaders actually engaging in yet another partisan battle over it. Emmett, a Republican, provided a very sensible response to rethinking flood control in our region. His assessment was broad scale and forward-thinking, while still acknowledging the recurrence of 500-year rain events during the last three years and the possibility of more to come. Emmett didn’t have to engage in a public debate over climate change to make the thoughtful point that flooding in the future needs to be considered in light of recent history that is disturbing, certainly different from past events, and possible in the future. He seems to be facing our reality in a no-nonsense way, with a wide range of necessary changes in policy based upon a clearly volatile set of circumstances. It did not bother me in the least that climate change, per se, was not brought into the discussion, even though my personal assessment would include it. Given the partisan nature of the climate-change debate in recent years, it is significant that an elected Republican official provided a good evaluation of our current state of major environmental, political, and economic challenges. Emmett has shown himself to be a realist in past local “natural” disasters, such as Ike, and as such gives me some hope that forthcoming attention to improving our lot is achievable by common goals and objectives free of overt political squabbling. As an historian, it is my job to trace the variables that may have led to our current state of crisis, but near-future decision making should give less attention to recrimination and more attention to lessons from the past that can provide insight for the future. The task of facing the impact of future storms will not be easy, nor absolute, but a little common sense goes a long way. Harvey demonstrated why Texans must be better prepared to address extreme storms, strengthened by warmer oceans due to climate change. While this shouldn’t be a partisan issue because it impacts everyone, climate change has become politicized. I certainly hope to see more acceptance of the science given all the state has endured, but based on the reaction to previous droughts and storms, I’m not optimistic we’ll see a lasting impact on public attitudes. I hope I am wrong. As with all major disasters, there are plenty of lessons to be learned from Hurricane Harvey. Top among those is that we have gotten markedly better at responding to disasters, even catastrophic ones. Where we continue to fall short as a nation, however, is in the areas of prevention and mitigation. Hurricane Harvey provides us a glimpse of what future disasters will likely look like. And while we will always need to have strong response capabilities, we need to focus much more of our attention on reducing disaster risks on the front end through smarter land-use decision making, sustainable development, and enhanced community resilience. The fundamental resistance by some folks to acknowledge climate-change risk is that they fear doing so means huge disruption to the economy. This is especially true if they work in oil and gas. Therefore, the path to move these folks isn’t to show how bad climate change is, but instead to demonstrate how reducing our emissions isn’t nearly as scary as they think. I’d be willing to bet that a big announcement about a new, low-cost carbon-sequestration technology that would allow for continued fossil-fuel use, but without the emissions, would do far more to move people in Houston toward accepting the reality of climate change than Harvey ever will. That said, those who are already there and accept climate science will see Harvey as yet another reason for immediate action. In the recent decade, the National Science Foundation supported development of decision-making tools to assess the regional need for adaptation to climate change. While cities like New York City utilized the newly available resources to make a detailed plan of climate-change adaption and risk, Texas decision makers have in general not seriously considered such plans. Thus, I am concerned that there will be no substantial change in the decision making unless the frequency or intensity (or both) of substantial storm systems increases substantially (for example, a 1-in-100-year storm like the 1900 Galveston hurricane will become a 1-in-50-year storm event, or 1-in 25-year storm event). I’d like to think that Hurricane Harvey has allowed Texans and their leaders to talk openly about the risks posed by climate change. I’ve been heartened to see the Houston Chronicle put articles about climate change top center of the front page and quote elected officials who cite climate change as a concern. The ability to talk openly about climate change is a good first step, but I think it will take years – or decades – for most Texans to explicitly incorporate climate change into policy and planning. The good news is that we can address climate change indirectly. Disaster response, flood damage reduction, land-use planning, open-space protection, building codes, energy efficiency, air quality and greenhouse-gas regulations, food production, and transportation are just a few examples of policies that address quality of life and climate change. Hurricane Harvey will leave an indelible reminder, for any of us who lived through it, of the hazards posed by storms fueled by a warmer climate. Already, we’re seeing local leaders show far more urgency to reduce our vulnerability to flooding, whether they acknowledge the climate connection or not. Whether that will translate into an urgency to reduce climate-warming emissions is far less clear. Earlier this year, we saw prominent skeptics like Congressman Lamar Smith [a San Antonio Republican who chairs the House science committee and has outspokenly attacked the findings of climate scientists] finally acknowledge the Earth is warming, but claim that’s a good thing. That will be a far harder argument for any Texan to make after Harvey. But ultimately, denial has been more about opposing solutions than denying or even understanding the science. So there’s no guarantee that the lessons of Harvey and this summer’s other hurricanes and wildfires will translate into a willingness to curb emissions. My reply would be, if not now, when? Though they don’t want to discuss it in public, I think privately they have to be thinking these signs are hard to ignore. Who hasn’t seen the increased intensity in droughts, flooding, and hurricanes unlike ever before? Perhaps when insurance companies will no longer insure the areas that constantly are affected, that will get their attention. Though there are those stalwarts who will never admit that climate change is real, I think this attitude will wane, as I do think the majority of Americans and Texans are seeing firsthand the evidence of climate change in their backyards. Bill Dawson is the editor and founder of Texas Climate News. Randy Lee Loftis is a senior editor for this publication.